I feel like I have mastered the power of the universe: I have grown my own sprouts!! It has been so exciting to test-drive the sprouting process: soak seeds, hang them to dry, rinse twice a day, voila sprouts! Seriously, that’s how easy it is. And there are all kinds of contraptions you can use to make sprouts, but I am newly in love with my “nut sac”, that I picked up from Meghan at one of her veggie workshops I attended a couple of weeks ago. It’s a fine mesh bag that I bought intending to make almond milk (post coming soon), but it also works really well for sprouting! Are you ready to sprout? Here we go, wheeeeeee! In the morning, drain the beans and rinse. Leave the bag suspended in the empty jar, securing with an elastic band around the top open edge of the jar. The jar will create a little greenhouse which will help your sprouts to grow. Leave this jar in a cool, dark place for optimal sprouting. In the evening, rinse the beans again, then hang them just like in step 2. You may start to see signs of sprouting! Amazing! Repeat steps 2-3 until you have sprouts the length you’d like to eat! 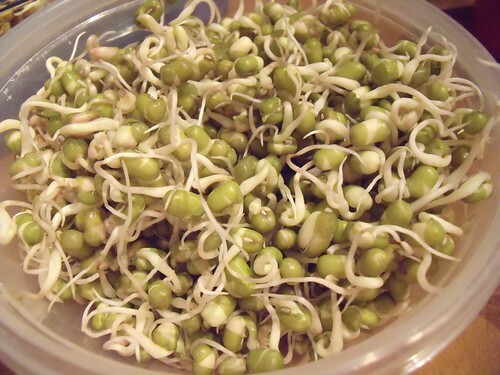 My mung bean sprouts were about 3cm (just over 1″) long. Optional: Pop the sprouts-in-bag-in-jar into a sunny place for about 4 hours so that the sprouts can grow some extra chlorophyll and green up a bit. Tasty and extra healthy for you! 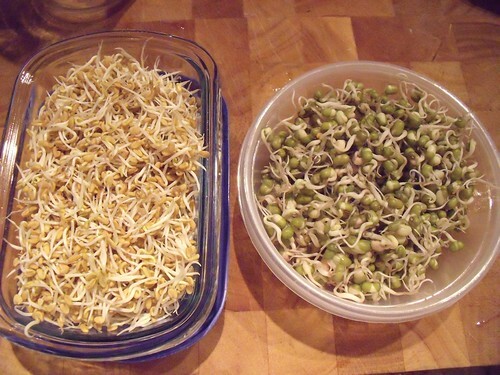 If you’re a visual learner, Meghan has a great video about sprouting that shows just how easy it is! I promise, you can totally do this! If you don’t have a “nut sac”, you can also use a piece of cheesecloth or muslin and an elastic band over the open top edge of the jar to drain your sprouts. 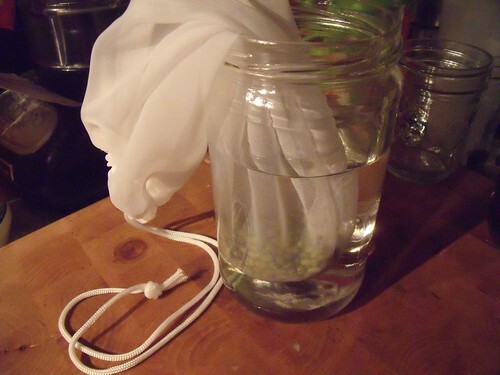 You’ll have to keep your jar at a 45 degree angle over a bowl or draining rack so that the sprouts don’t sit in water and grow other creatures (like mold). I also tried out the “strainer and bowl” method — and it worked really well when the strainer I had was just a hair larger than the opening of the jar I used! You can see here that I had my jar turned upside down over a strainer over a bowl, and that the extra liquid is draining out of the jar into the bowl. You can follow all the same steps above, and get awesome sprouts. These smaller sprouts are zippy and spicy sprouts I grew from fenugreek seeds! Fenugreek seeds (also known as methi and used in Indian cooking for potato dishes and dhals) make smaller sprouts than the mung bean sprouts — these were about 1cm (1/2″) long when I harvested them! I used 1/4c. 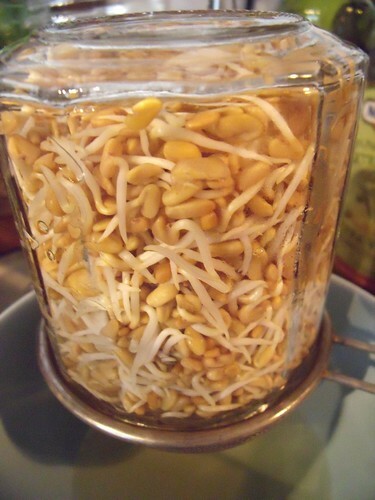 of fenugreek seeds and a 250 mL jar that was FULL of sprouts after 2 days! How about a sandwich? My favourite combination is lemony/garlicky hummus on Gluten-Free Quinoa & Flax Seed Bread topped with a big crunch of sprouts. Salad toppers! They’re great as a garnish and add such great flavour! I think they’d be great on my Red Quinoa Salad with Lemony Goat’s Cheese. Sprouty hummus! 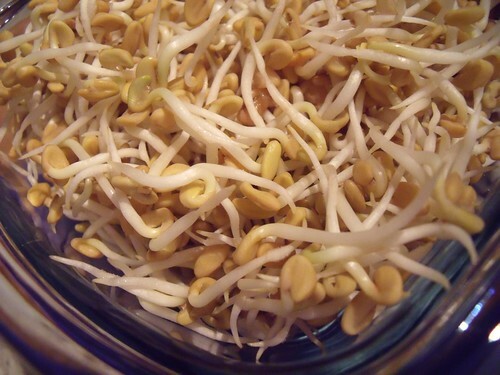 Puree your sprouts along with a little tahini and lemon juice to make a sprouted bean hummus. Soup toppers – add some crunch. Yum. Just eat them. They’re addictive. Trust me. 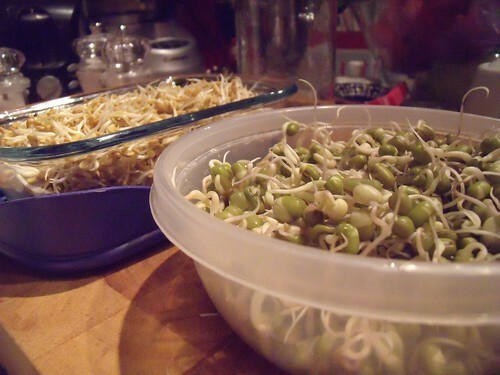 What’s your favourite way to use sprouts in your kitchen? I’d love to hear in the comments below so I can have some new sprouty dishes! Wow!! The sprouts look yummy & the process is so straightforward. Think I may give this a try for fresh crunch in my snadwich this winter. Please keep writing about your nut sac.